We choose Southern Implants; pioneers in dental implant technology focused on cutting-edge technology and patient outcomes. For those who want to replace a missing or broken tooth or multiple teeth, whether it’s recent or something you’ve been considering for years, dental implants may be for you. You’ll come into our practice for a consultation, where we’ll discuss the suitability of dental implants with any other treatment options available to you. We’ll make sure you have a clear idea of the costs involved. Then, if you choose to move forward, we’ll get a 3D scan of the bone area around the tooth space. This gives a complete look of where the implant will be placed, if there is the space required for it, and the measurements of the implant. When you’ve made the decision and come in for dental implant treatment, we’ll bring you into a sterile treatment room where you will be given either twilight sleep or IV sedation. 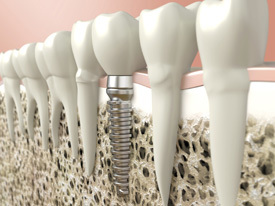 We then place a thin screw within your jaw that will support the implant. We’ll give you a temporary crown to use after the procedure, and your permanent crown will be put in after 3-4 months’ healing time. *Any surgical or invasive procedure carries risks. Before proceeding you should seek a second opinion from an appropriately qualified health practitioner. »» Click here for more information about our Dental Implant services. Whether you want to replace singular, multiple, or all your teeth, dental implants will allow you to have full oral function. Call our dentists in Mindarie today to find out more – (08) 9407 7888. Dental implants for Mindarie, Clarkson, Butler, Quinns Rocks, Quinns Rocks, Iluka, Joondalup and neighbouring communities.